Practicing charts. Reflecting. Thinking of my mother. Seeing her hands at the piano, big hands, capable hands, playing by ear, singing along. Suddenly realizing many decades after the fact that the reason she nagged me to practice so while I sullenly counted off the required 30 minutes per day, the reason she sounded so angry, was because what I took for granted she would have given her eyeteeth to have at my age or at any time. Only there was never enough money for more than one of us to have those lessons. Or the voice lessons I got while her songs went wanting. Her yearnings for mine. They bought me a grand piano when I was 14, managing to pay it off $10 a month, a miracle made possible for Dad and Mama because the man in the piano store took a liking to me. A privileged life lived in music. Regrets, tinged with shame for those lessons I wasted. My mother’s hands. A debt beyond paying. 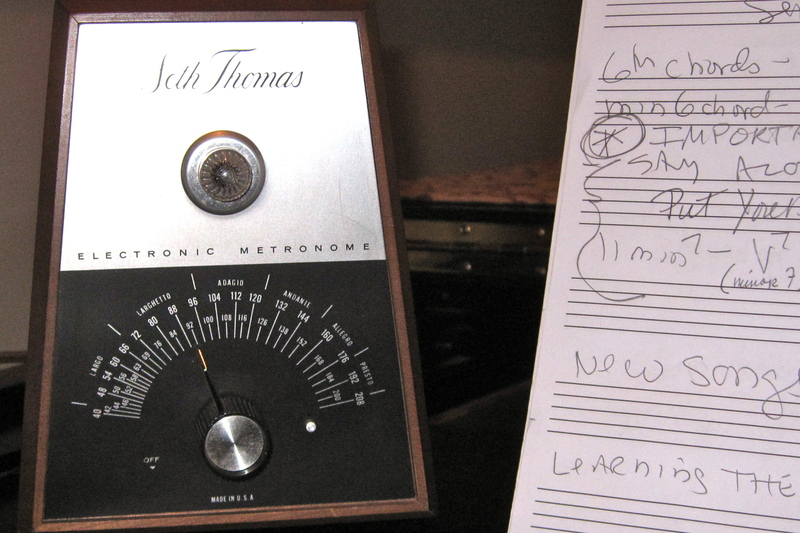 When I was in high school, my piano teacher, Mrs. Gertrude Brown, had an electric metronome. Seth Thomas. Eminently audible over the sound of the piano. It had a solid, no-nonsense, maddeningly dispassionate click. Plus an orange-yellow light that blinked at you in time with the click. Mrs. Brown used that metronome every week in my lessons. I was the sort of piano student who needed a metronome. I had a love/hate relationship with her electric metronome. It was better than my own traditional wind-up Maelzel model (named for the 1815 inventor, or at least, patenter, of the metronome) which looked like a squat brown wooden obelisk that belonged in Egypt. The wind-up was what my parents – who also had to pay for my voice and piano lessons – could afford. I liked very much how my own metronome looked, actually, but it was a pain to set the small slider on its weighted arm – which stood straight up and wagged the chosen tempo at you like an admonishing finger – to the myriad metronome markings Mrs. Brown expected me to use when I practiced. Also, the sound of its click – when I was able to hear it over the sound of my piano – seemed sort of prissy compared with the richer sound of Mrs. Brown’s modern appliance. Though I was confident I was good at accurately “intuiting” my metronome’s somewhat sedate click while I practiced, Mrs. Brown’s implacably audible one soon revealed otherwise in lessons. I have had three lessons with my current piano teacher, Marc. We are working on my being able to improvise accompaniments from charts – I often need to play off of charts for my voice students. A chart only gives you a melody line with the names of the chords written above it. Sometimes just the words with the chord names written above them (in which case, yes, I do sometimes have to ask them to “hum a few bars”). Anyway, as preparation for my second lesson, Marc assigned scales (“there are only 24!”), arpeggios, a Bach Invention and chord progressions along with some charts to read, which I carefully practiced for a month, all the while remembering Mrs. Brown’s constant instructions for accuracy and stea–dy tem–po. How wonderful to have mastered internal counting at last! At my second lesson, Marc listened to my scalework and suggested that I may want to work with a metronome. Both electric and wind-up metronomes have long been superceded by small, square battery-operated models and smartphone apps which have no grace to them at all. They sound ugly and they look ugly, though they are ack-you-RAT. So, I went on Amazon and found a used metronome like Mrs. Brown’s, which I had secretly coveted. It arrived a few days later, very carefully wrapped. I plugged it in next to my piano, waited for it to warm up (it has an actual vacuum tube inside!!) and, after about ten seconds, heard a familiar, solid, no-nonsense, maddeningly dispassionate click. Which now sounded sort of warm and fuzzy. . . I compared it to my husband’s battery-operated one. Definitely. Warm, fuzzy. I practiced all month long for my lesson, enjoying my electric metronome’s now satisfying, accomodating, warm and fuzzy sound – which allowed me to play with increasing speed and accuracy those scales I used to dread so much and, as I played, to reflect philosophically upon the meditative nature of scale patterns when coupled with those ever-encouraging clicks. It made me feel very close to Beethoven, who was among the earliest to recognize their worth. At my next lesson, Marc suggested I may want to pick a slower metronome marking.